Design of Between The Lines, a community for young people to discuss and debate issues relating to drugs with others and find information and help, which ultimately informs and reduces problematic use. Between The Lines was selected as an Official Honoree for the Charitable Organizations/Non-Profit category in The 14th Annual Webby Awards. The Official Honoree distinction is awarded to the top 15% of all work entered that exhibits remarkable achievement. With nearly 10,000 entries received from over 60 countries, this was an outstanding accomplishment. Through social media channels such as Blog topics, an online peer community is created that provides an ongoing, stimulating conversation. Also through use of Innovative technology such as the Drug Facts visualiser, users are engaged in an interactive way that makes it easy for young people to understand and make informed and safe choices about their drug-taking behaviour. Art direction, illustration and design of Now What, a website dedicated to to assist young people in dealing with their own or a family / friend’s cancer diagnosis. This project put the design process typically found in a waterfall-type process into an Agile process environment that software and web developers use to produce software and websites. Specifically, the design of the website did not take a ‘head-to-toe’ approach that normally starts with a variety of home page designs based on user research, but instead built the ‘bones’ structure first as according to user-needed functions and then start to fill in the necessary pieces such as muscle, and skin last. 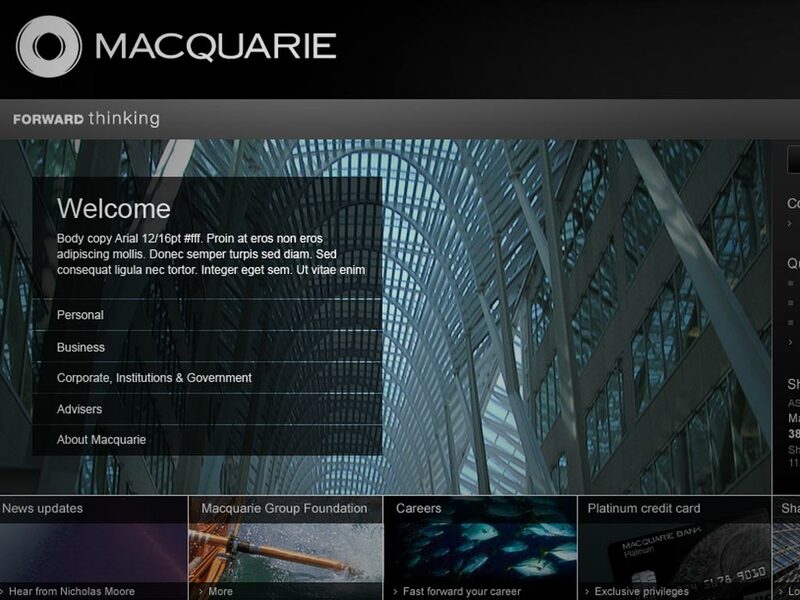 Art direction and design on behalf of Profero has evolved this 3 year joint project with Different into a very well considered piece for the Macquarie Group (formerly known as Macquarie Bank). The Vivacity 09 website, designed for Community Engine wins an honoree for the 2009 Webby Awards. Based upon a calendar highlighting the current day events, it allowed user to browse back and forth and filter for certain types of events. This was a proposal written by Stuart Buchanan and designed by myself on behalf of Mixed Industries to win the pitch to hold a series of Creative Sydney events as part of the Vivid Sydney festival. Creative Sydney was about ideas taking place in May & June 2009 which centered around a series of events that celebrate the wealth and diversity of Sydney’s creative industries. These events augmented Vivid Sydney. A unique new public festival that aimed to showcase Sydney as a major creative hub in the Asia-Pacific region. Funded by the New South Wales State Government, via Events NSW. Banzai is a sports aggregator website created for Yahoo!7 that aims to allow other sports websites to feed into this portal. Users will find content easy to digest, follow and stay informed on the sport that is important to them. Banzai gives them a “home base” where they can easily keep up with weather conditions, events, results , news, and organisations central to the enjoyment of their sport. Plus, they can choose to get updates on topics they want to follow and share their own perspective on articles, videos, or even local restaurants…all from one convenient place. Focussing double-diamond design strategy on getting the right ideas to get the ideas right.